Having received the No. 75 North American skater ranking by NHL Central Scouting allowed Moose Jaw Warriors defenseman Travis Hamonic to attend the Draft Combine. As the final North American skater invited to participate in the 2008 NHL Scouting Combine last month, you would think 17-year-old defenseman Travis Hamonic of the Western Hockey League's Moose Jaw Warriors would be a nervous wreck. After all, what, exactly, did the No. 75-rated North American skater by Central Scouting have that No. 76 Samuel Groulx or No. 77 Patrick Wiercioch didn't? "I'm very conscious when we get to rankings within that 70 through 75 range, but there's got to be a line drawn somewhere," said the NHL's Director of Central Scouting, E.J. McGuire. "We felt strongly, based on our assessments, that the No. 75 guy is different in many ways than the No. 98 guy. I congratulate Travis, but just because he was invited does not guarantee he'll be drafted, even though 98 percent of the players invited to the Combine get drafted. The most important thing for him was that he was there and had an opportunity to make an impression." That's precisely how the Winnipeg native approached his chance of a lifetime. "Everything I've proven on the ice to reach this point, I wanted to prove with just as much passion in the interview rooms and in the workouts (at the Combine)," Hamonic said. "I wanted to prove my work ethic and allow these scouts and general managers to see that I'm a well-spoken man. I went to the Combine wanting to back everything up that I've accomplished all year, proving my professionalism and leadership." It's the humbleness and conviction in Hamonic's voice that likely afforded him a spot among the 107 prospects at the Combine. Hamonic had 15 interviews over two days prior to his fitness testing in Toronto. It also didn't hurt that Hamonic exhibited a toughness and ability to play through pain. "I talked to his coach at Moose Jaw (Dave Hunchak), and he told me that Travis missed a month of the season with a broken jaw but actually finished the game in which he suffered the injury," said Peter Sullivan, who scouts the WHL for NHL Central Scouting. B.J. MacDonald, who scouts the WHL and British Columbia Hockey League, feels Hamonic could be a sleeper in the 2008 Entry Draft, scheduled for June 20-21 in Ottawa. "Travis is very heady and steady," praised MacDonald. "He's smart with the puck, has good natural instincts and reads the play nicely." Hamonic didn't consider it a big deal that he was the final North American skater invited to the Combine. "It was definitely a great honor to be there," he said, "but, I mean, I could be No. 75 or No. 50 and the bottom line is that it's just a number. Everyone at the combine was there for the same reason -- making the most of an opportunity." Hamonic, who had five goals, 17 assists and 101 penalty minutes in 61 games and was named Scholastic Player of the Year at Moose Jaw in 2007-08, also was invited to play for the gold-medal winning Canadian team at the 2008 World Under-18 Championships in Kazan, Russia, in April. "Travis comes to play in every game. He's very energetic and has improved by leaps and bounds," Sullivan told NHL.com. "He's the type of kid you notice each time he's on the ice." 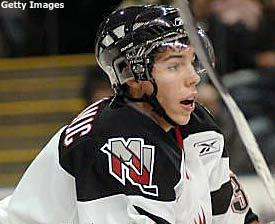 On the Canadian U-18 Team, Hamonic had an opportunity to play alongside Central Scouting's No. 18-rated skater, defenseman Colten Teubert. "It was nice that we won a gold medal together and, playing for Regina, I've also gone up against Travis many times," Teubert told NHL.com. "I feel he's a great player and certainly deserved a chance at the Combine. He's one of those guys you would love to have on your team." At Moose Jaw, Hamonic gained experience on the power play playing alongside Keaton Ellerby, a 2007 first-round draft choice (10th overall) of the Florida Panthers. Ty Wishart, a first-round pick (16th overall) of the San Jose Sharks in 2006, also fortified the blue line for the Warriors. "It's very tough comparing players, but some drafted in the first round never improve in their second year while those drafted in the middle rounds have been able to make that turnaround," Sullivan said. "That's where I see Travis. He's a good skater with quick feet, and while he could be as high as a second-round pick, it wouldn't surprise me if he's chosen in the sixth round, either." Following his successful Combine, Hamonic (6-foot, 190 pounds), who also earned a silver medal with Team Manitoba at the 2007 Canada Winter Games, is looking forward to Draft Day. "Right now, he's a good junior-hockey defenseman, but what he has to do to get to the next level is develop his offensive game," MacDonald said. "He plays the power play for Moose Jaw but must learn to run the power play. If he can learn and add that offensive flair, which he is capable, then that'll put him a cut above and be more of an asset for a pro team." It wouldn't surprise MacDonald if Hamonic were drafted as high as the third round. "It all depends on how teams felt he did at the Combine," he said. Hamonic is confident his determination and desire will get him through. "My coaches at Moose Jaw worked with me so well throughout the year and always put in the extra hours with me and I'll always be thankful for that," he said. "It's because of that work that I'm benefiting right now and I don't intend on losing it. "I know the importance of speed, skating and skill and how you must possess all three to be a complete player. I know I'll have to be a well-rounded skater. You can't just have one attribute and expect to play a big role for a team, so that's something I'll work at every day."